Have you ever driven in historic neighborhoods and had trouble finding a parking space or specific attractions? If so, you are not alone! Uptown San Diego is one of the oldest and most eclectic districts in the City. It boasts 2,700 acres of six distinct neighborhoods where historically significant homes, post World War II era apartments, trendy food establishments and boutiques mingle with modern high rise condos, medical and commercial areas. Parking spaces are dispersed into small lots or street parking and getting your bearings can be quite a challenge if you’re not familiar with the area. That’s where Graphic Solutions can help–as we have for Uptown–by creating wayfinding signs that guide visitors to parking and to each unique neighborhood while linking it all to the Uptown District. We used consistent messaging organization, font types and font colors to create a visual standard for the district of Uptown, then designed unique sign shapes, logos and background color to differentiate each Uptown neighborhood. Now, visitors and residents in this thriving, bustling cultural enclave can easily navigate, park and explore all that Uptown has to offer. Clearly marked parking encourages foot traffic and visits to local businesses. Sign shape and background color differentiates neighborhoods. El Cajon Boulevard’s storied past began when it was part of U.S. State Route 80; the main route connecting all points east into San Diego. Some of the City’s oldest hotels still operate along the busy strip, including the historically significant Lafayette Hotel, built in the Grand Colonial Style in 1946. The completion of Interstate 8 in the 1960’s reduced traffic and visitors to El Cajon Boulevard and many areas fell into disrepair. In 1988, the El Cajon Boulevard Business Improvement Association was formed to revitalize the many diverse communities along El Cajon Boulevard. 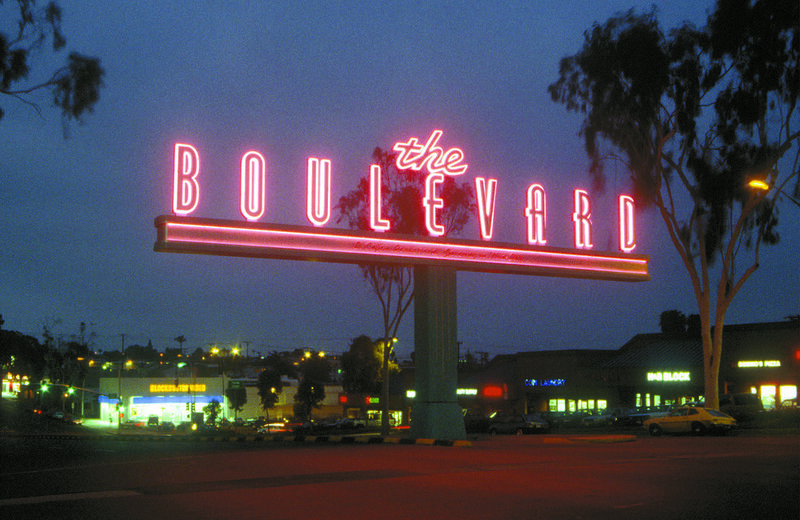 Graphic Solutions was honored to collaborate with the El Cajon Boulevard Business Association and the City of San Diego to develop a rebranding of this area, developing the name and iconic gateway sign: The Boulevard. Design solutions include a type-face reminiscent of the 1950’s and incorporating distinctive turquoise and coral colors as well as neon. The bold design evokes a sense of optimism while honoring the area’s rich history. The project has won an Orchid Award and a national award from The Society for Environmental Graphic Design. This rebranding was the beginning of an ongoing renaissance of the Boulevard and surrounding neighborhoods. Today, vacancies are down and property values are up. Exciting new plans are underway to build upon improvements, transforming communities surrounding The Boulevard into model, transit-oriented neighborhoods. The Graphic Solutions team celebrated our last Holiday Party at our Main Street location with neighbors and friends, enjoying delicious Mexican food, a slide show tribute to Graphic Solutions’ amazing history and a “white elephant” exchange. The job market was tight in 2018. 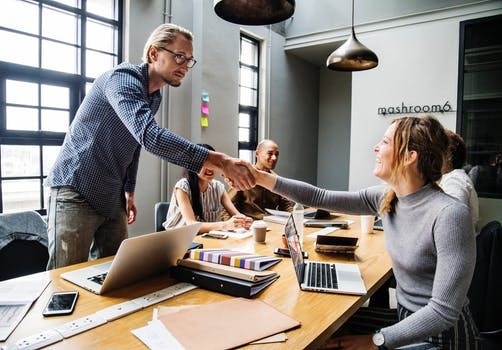 Many traditional companies are making the physical work environment more enjoyable, offering a full array of amenities for work spaces that are flexible and fun. Graphic Solutions created a comprehensive interior signage and environmental graphics program for a large utility company, used for ongoing renovations throughout their corporate campuses. 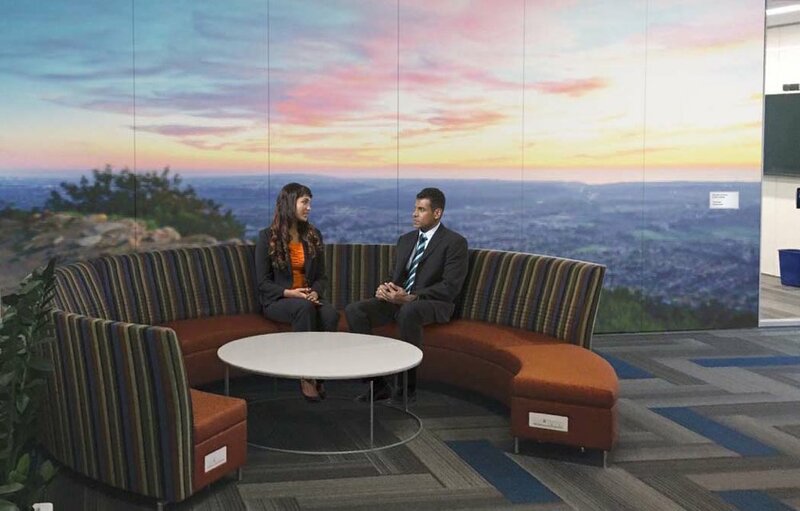 How is your company adapting the work environment to meet employee expectations? “Shared Governance”: Southwestern College–students, faculty and staff inspect mock-ups for new wayfinding signs to ensure optimum accessibility. Increased enrollment spurred California community colleges to expand and develop new campuses. In some cases, they partner with private sources of funding for new development. They are also focusing on refurbishing outdated buildings and student housing to incorporate technologies and amenities to enhance the learning experience. Now, more than ever, colleges need wayfinding programs which are accessible and comprehensible to visitors and students of all backgrounds and abilities. As we wrap up another successful year, we want to thank our clients and creative partners. The very core of our success is working together with our clients, other design professionals and stakeholders. Great things happen when great minds come together! What improvements are you planning in 2019? Graphic Solutions’ proven team-building techniques can move your project forward and improve navigation for students, faculty, visitors and staff. Click below to learn how.